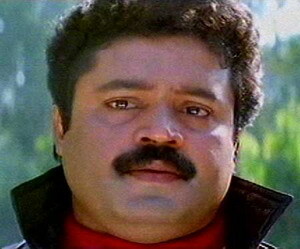 Suresh Gopi, the action hero of Malayalam cinema, was born on 25 June 1958. He entered the silverscreen as a child artist in the film Odayil Ninnu in 1965. Suresh Gopi returned to Malayalam films after sometime in 1986. He acted as a supporting hero or as a villain in many movies. His first few movies were Rajavinte Makan, Manasilloru Manimuthu, Nandi Veendum Varika, Vazhiyorakkazhchakal, P.C. 369 and Irupatham Noottandu. He continued his acting career through movies like New Delhi, Witness, Moonnam Mura, Manu Uncle, Oru CBI Diary Kurippu, Nineteen Twenty One, News, Innale, Douthyam, Akshrathettu, Oru Vadakkan Veeragatha, Nagarangalil Chennu Raparkam, Kouthuka Varthakal, In Harihar Nagar, Aanaval Mothiram, Parallel College, Kuttapathram, Ente Sooryaputhrikku and Daddy. Though he had acted in a number of movies, he was always sidelined by other heroes in the early films. Suresh Gopis major breakthrough came with the action movie Thalasthanam in 1992. Then he acted in many hit movies like Manichithrathazhu and Paithrukam. He received many action films after the success of Thalasthanam. He performed well in the role of a Police Officer in films like Ekalavyan and Commissioner. His portrayal of the police commissioner Bharath Chandran IPS in Commissioner (1994) shot him to superstardom. Suresh Gopi continued doing action films like Mafia, City Police, Rudraksham, Kashmeeram, The City, Chukkan, Thakshasila, Karma, Aksharam, Rajaputhran, Mahatma, Janathipathyam, Gangothri and Bharatheeyam. His films Lelam and Vazhunnor became superhits. Some of his major films in the next few years were Pathram, F.I.R, Satyameva Jayate, Millenium Stars, Cover Story, Thenkasipattanam, Randam Bhavam, Nariman, Makalkku and Sundrapurushan. But after a series of flops, he decided to take a break. In 2005, he returned to the silverscreen for portraying a character he had done 11 years ago, 'Bharathchandran IPS', in a film with the same name. The film became a superhit and Suresh Gopi retained his place as a Superstar in the Malayalam film industry. He played as a hero in many hit films like Rashtram, Interpol and Chinthamani Kolacase. His new films are Pathaka directed by K.Madhu, Aswaroodan by Jayaraj. Suresh Gopi's role in the film Kaliyattom as Kannan Perumalayan won him the National Award for the best actor in 1997. He was nominated for the Kerala State Award in the the Best Actor category for his portrayal of a mentally distressed person in Ullam and as a Doctor in Makalkku, but lost out to Mammootty. Sures Gopi is married to Radhika and the couple has four children.